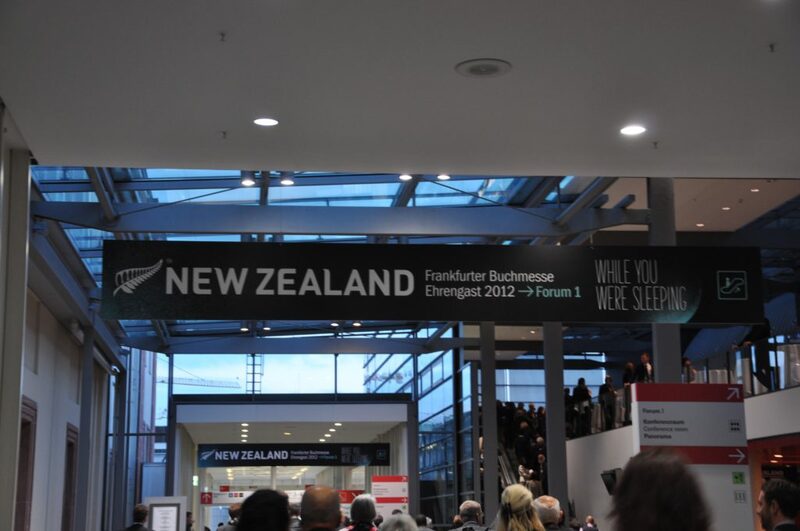 On the face of it, New Zealand’s turn as guest of honour at the Frankfurt Book Fair four years ago was a great success. But what have our writers and publishers got to show for it? Mark Broatch investigates. The Frankfurt Book Fair is the biggest – and one of the oldest – trade fairs in international publishing, proud of its flashy statistics: more than 7000 exhibitors from more than 100 countries, more than 4000 events, with 275,000 visitors and 10,000 accredited members of the media. Each year since 1976 the Book Fair has selected a ‘Guest of Honour’ country, a programme designed – its web site states – to showcase that country’s ‘book market, literature and culture’. In 2011 the slogan of the Guest of Honour (GOH) at the Frankfurt Book Fair was the Nordically unhumble Fabulous Iceland. In 2013 it was Brazil – A land full of voices. In 2014, the GOH opted for glacially groovy: Finland. Cool. Last year Indonesia’s slogan was 17,000 Islands of Imagination. Flanders & the Netherlands were the guest of honour this year (the occasion opened by the King and Queen of Belgium, no less), with the slogan Dit is wat we delen (This is what we share). New Zealand’s slogan in 2012 for the greatest opportunity in world publishing? While you were sleeping. The slogan (which some writers travelling to Frankfurt were contractually bound to promote) suggested busy beavers in the lower hemisphere, eager to knock out a range of goods and services for wealthy Europeans while they’re getting some shut-eye – that is, primarily a business and tourism pitch. Oddly enough, either of the German or Maori alternative translations seem more immediately engaging. Bevor es bei euch Hell wird is the German, or Before light is with you. The te reo was He moemoeā he ohorere, or A vision of a surprise. The business and tourism slant is one complaint that some in the literary community have made – and continue to make – about New Zealand’s guest role in Frankfurt: that it seemed about selling the country as much as showcasing our writers and writing. 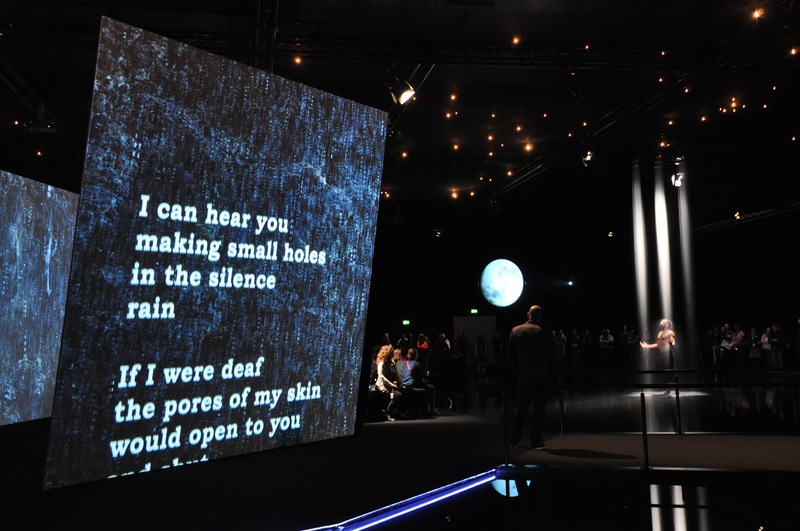 There were other grumbles – about the design, content and experience of the high-concept but noisy and watery Forum pavilion; that those who organised it were naïve about the fiercely mercantile nature of the Frankfurt Book Fair; that there were too many performers and not enough writers (100 to 67); and that the three criteria by which writers were invited were too limited or inconsistently applied. These criteria: either the writer should be published recently in German; have an invitation from a German literary festival, cultural institute or publisher; or be included for wider cultural or ‘other’ purposes. But probably the most damning charge was that the GOH programme didn’t pay off in terms of the stated literary raison d’etre: increasing the number of publishing contracts, translation deals and ongoing invitations to writer festivals. The centrepiece for each GOH is a 2500 sq m pavilion in the Forum. Here’s what you would have seen inside New Zealand’s. The space was darkened, as though visitors were stepping into the night. A number of illuminated (and scented) ‘sub-pavilions’ created a central meeting place that appeared to float in a shallow black ocean – carefully installed over a new and expensive parquet floor – under a southern sky of stars and moon. 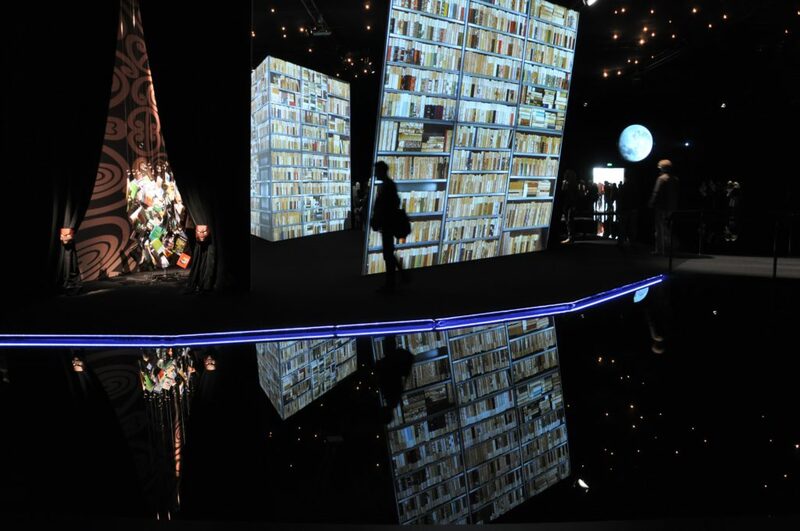 Each sub-pavilion contained a library of books suspended as chandeliers. Three-and-a-half-metre-high screens projected lines from works and images while a shirtless performer braved the water to speak the words. Projected were the Maori origin story, extracts from the works of Alan Duff, Maurice Gee, Katherine Mansfield and Hone Tuwhare, as well as scenes from graphic novels, the film of An Angel at my Table, and the song ‘Poi E’. The tender document for the Pavilion was issued by the Ministry for Culture and Heritage – Manatū Taonga (MCH) on November 18, 2011 and the deadline for proposals followed soon after, on December 2. Such a broad brief meant that MCH was working with a number of other agencies, including the Ministry of Foreign Affairs & Trade, New Zealand Trade and Enterprise, Tourism New Zealand, Education New Zealand, Creative New Zealand (CNZ), Te Puni Kōkiri, the Ministry of Science and Innovation and the Publishers Association of New Zealand (PANZ). 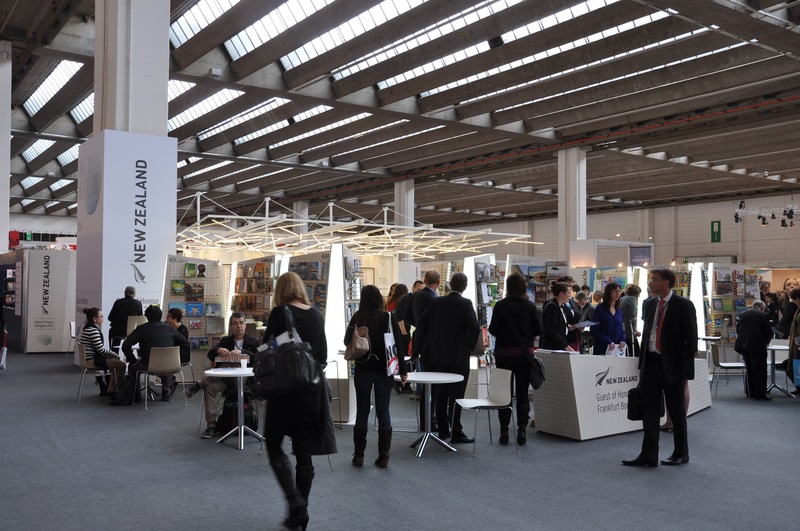 It also meant that the target audience wasn’t just the international publishing industry and media: it was businesses interested in New Zealand content, products and services, and – on the Fair’s two public days a German public interested in New Zealand culture, tourism and products, not just its literature. Garlanded architects Patterson Associates (the Len Lye Centre) and Inside Out Productions, run by multimedia star Mike Mizrahi (Rugby World Cup opening ceremony 2011), won the contract, and the pavilion attracted much praise for its high-concept design. (‘The books “talked” to each other across the central space via an audio-visual show,’ says Patterson’s publicity material, ‘referencing how literature speaks to us all.’) It lured a record 90,000 visitors over the five days of the fair. The praise was codified in the form of accolades, the pavilion design taking out the supreme award of the New Zealand Interiors Awards in 2013, and an NZIA international architecture award in 2014. 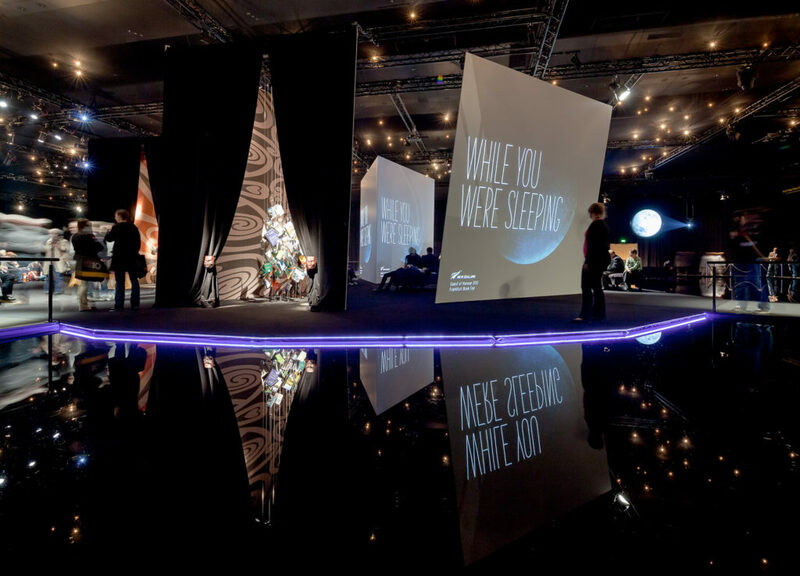 The While You Were Sleeping film by Inside Out won the spatial communication category at the 2014 Stuttgart Festival of Animated Film. Her publishers spent the function in the lobby ‘eating dry canapés and drinking mediocre NZ wine and wondering what they were doing there’. If they had later inspected the pavilion, they would have found precious little of interest, says Olsson, who believes that for people unfamiliar with the books, the film clips were ‘meaningless’. The MCH brief had stipulated that the pavilion design needs to avoid ‘acoustic interference (for example simultaneous reading and concert in a place nearby)’ and the management of likely visitor flows and different types of audiences. Both Patterson and Mizrahi later acknowledged some issues with the functionality of the pavilion, including the noise spill with writer panels. Patterson suggests that acoustic walls rather than fabric would have solved the noise problems, but these were outside of the budget. He believes the main challenge was the queuing. ‘The pavilion attracted a record number of guests; more than any of us were expecting. As a result the pedestrian flow needed to be constant, continuous and unimpeded. However, the audio-visual wasn’t looped, rather it played similarly to a short film and visitors were held at the door at the beginning and end of each screening.’ The queues, he says, were exacerbated by people wanting to sit down and see the whole show from start to finish. There were ramifications beyond the city, too, as the GOH country is also profiled at the 25 other international book fairs each year at which Frankfurt has a stand. In August 2012 New Zealand was guest of honour at Frankfurt’s Museumsuferfest – a festival that draws crowds of around three million people. And MCH points out that in 2012 82 New Zealand writers featured in more than 260 literary events in 51 cities all over Europe. Carl Nixon agrees. His first novel, Rocking Horse Road, had been picked up by independent Bonn-based publisher Weidle Verlag, a decision made only because the publisher ‘felt that the accompanying publicity and rise in profile of the guest country made publishing a New Zealand novel a no brainer.’ Rocking Horse Road was picked as one of the top crime novels of the year by several German newspapers, resulting in a print run of 10,000, and Weidle Verlag decided to publish Nixon’s next two novels. The novelist’s profile in the German-language market led to the translation and publication of some of Nixon’s short stories, and the optioning of one of those stories, ‘The Raft’, by a Swiss film producer. None of this, he believes, would have happened without the 2012 GOH programme. Fiction writer Catherine Robertson, whose second novel had only just come out in New Zealand, found the camaraderie and names-to-faces helpful. In Frankfurt she met – for the first time – thriller writer Paul Cleave, already a star in Germany; they shared a German publisher, Heyne, part of Penguin Random House Germany. ‘It was a buzz seeing my German editions on the Heyne stand, plus my agent had just sold my first book to Italy, so I met them too. And my agent was there, so I trekked off to see her regularly.’ But Frankfurt didn’t lead to more German business, and Heyne rejected her third book. The Italians didn’t take any more books either, she says. Interviewed for this feature, Chapman says that the criteria New Zealand developed are now recommended to all GOH countries. Frankfurt is wider than books, he insists: one year a producer of the Harry Potter films was a keynote speaker, so having Sir Richard Taylor of Weta Workshops there wasn’t an unusual decision – especially given that Weta is an e-book, paper, app and film producer, reflecting the bigger picture of contemporary publishing. As to whether it would have been better to take 100 authors rather than so many performers, Chapman points out that the books programme took up the biggest part of the budget. Several Wellington writers travelled to Frankfurt without meeting any of the criteria directly, something that irked some of the invited writers who felt squeezed out of reading or speaking events, and continues to irk some of the non-invited. VUP publisher Fergus Barrowman, who otherwise declined to comment about the virtues of Frankfurt 2012 for this feature, saying he had recently posted on social media ‘that we need to stop beating ourselves up’, notes that these writers were paid for by Victoria University, ‘a major sponsor … [that] made a late decision to send extra writers’. Barrowman remembers these ‘extra writers’ as three VUP authors and two of Victoria’s academic staff. Mewburn was sympathetic to tight budgets and small-country pragmatism, but felt that the tourism agencies had hijacked the appearance, and thought having 100 performers and 60-odd writers had got the balance wrong. He claimed a few writers who were in the area had been ‘diverted for budgetary reasons’ – possibly referring to Morris and Chad Taylor, both then resident in the UK, although both had books published in German to promote in Frankfurt. The Frankfurt contract requires both a writers’ programme and a cultural programme, so the decision was made ‘to try and showcase New Zealand creativity in as many forms as possible.’ This included writers for children and YA, like Joy Cowley – one of the speakers at the Fair’s opening ceremony – as well as Kate De Goldi and Bernard Beckett. 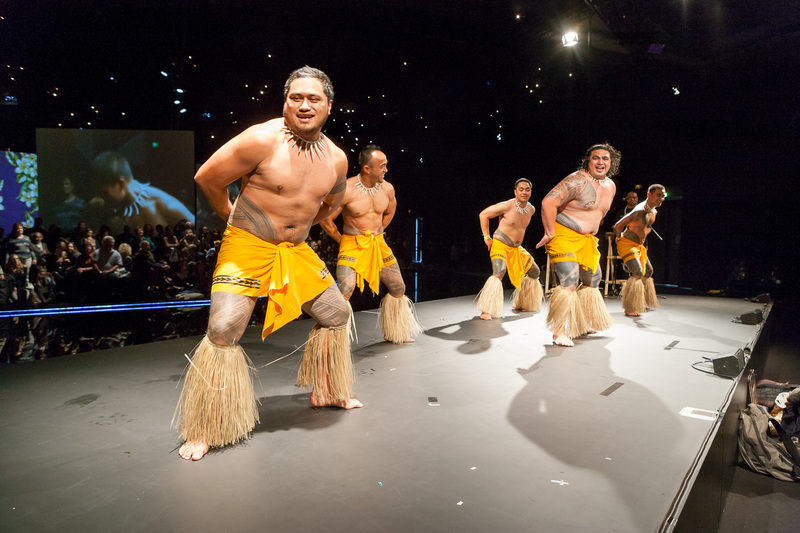 The kapa haka performers might have been one reason the New Zealand pavilion attracted twice the visitors of the previous best pavilion. ‘We did take more performers than authors,’ Chapman concedes, ‘but that was because one kapa haka group was one event, whereas one author was one event. There were many, many more author events than cultural events.’ Tourism New Zealand had nothing to do with GOH, he adds, as it had decided Frankfurt had no particular value for them. ‘Any tourism effect was incidental as a result of the overall programme,’ says Chapman, though he points out that ‘a year later the percentage of Germans who saw New Zealand as a cultural tourism destination’ rather than just a scenic one was much higher. Were the organisers naïve? 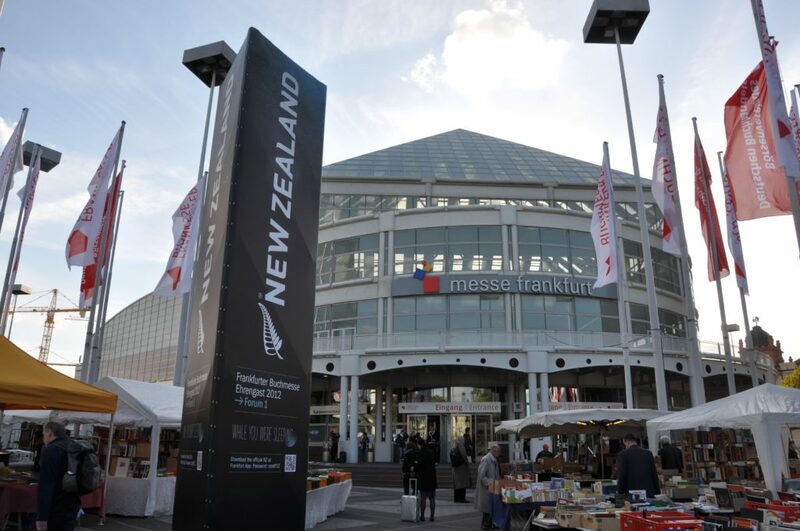 Olsson describes Frankfurt as ‘a hardnosed trade fair, where publishers and agents trade in 15-minute slots and run from one meeting to the next.’ Many of our local publishers represent New Zealand titles and authors there, year after year, and must know that Frankfurt is a tough business environment. But Olsson remains scathing of our 2012 efforts. 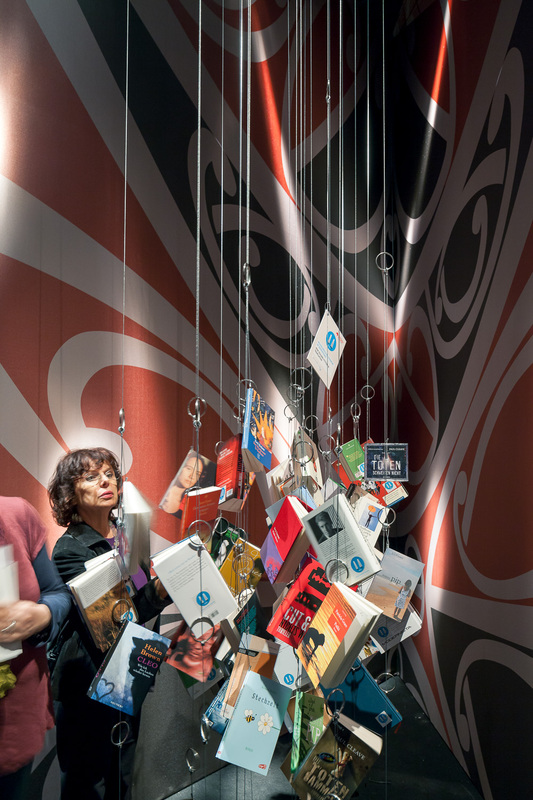 Instead of spending so much money on flying in authors and subsidising translations, Olsson argues that money needed to be spent on bringing more people involved in New Zealand publishing and giving them a larger-than-usual presence in the Exhibition Halls. Melanie Laville-Moore, current PANZ president, points out that 36 publishers – more than 50 people – were on the New Zealand stand in 2012, when 20 is more typical. Tanea Heke, New Zealand’s Project Director for Frankfurt, seemed to be under no illusions. A former actress who’d worked as Exhibitions Manager for Te Papa and artistic director at Taki Rua Productions, Heke had managed the promotion of New Zealand art and artists at international events like WOMEX and the Venice Biennale before the Frankfurt GOH appointment. In March 2012 she spoke to Radio New Zealand Concert’s Upbeat programme from the earlier, smaller books festival in Leipzig, generally regarded as more ‘literary’ in focus. She was there accompanying ten New Zealand authors and several publishers. ‘At Frankfurt it is madness, complete madness,’ she said. ‘It’s all about the trade, it’s all about the publishers, it’s all about trading rights, it’s all about what’s happening in books and content, comics, cosplay, you name it. Three hundred thousand people go through it in five days.’ She cited a New Zealand publisher on the toughness of Frankfurt for writers, saying it can destroy their confidence as ‘it’s not about them at all, it’s about the business of selling rights’. Frankfurt, she believed, was a chance to showcase everything that New Zealand does, ‘whether that be trade and innovation and tourism’. She also spoke of ‘wonderful cultural work that we’ll bring over’ and listed museum events alongside kapa haka; contemporary musicians; stalls of beef, lamb, venison, and wine; the Icebreaker clothes company, Kea vans, and tourism operators. ‘So we’re going to make a trade fair out of a museum weekend?’ asked the interviewer. ‘That’s cheeky,’ the interviewer responded. Cheeky – or lacking focus? Is the Frankfurt Book Fair really about ‘trade and innovation and tourism’? Was enough emphasis being placed on books and writers? Mewburn, whose wife is German and is a regular visitor to Germany, didn’t think so. ‘All of the media coverage I’ve seen is saying, where are the books?’ In June 2012 Barrowman tweeted: ‘The Frankfurter Allgemeine Zeitung is puzzled about the low profile of books in NZ’s Frankfurt plans’. With Germany as New Zealand’s second-biggest export destination in Europe, it’s not surprising that the opportunity to see more than books was too tempting to resist. A ‘New Zealand is Cooking’ week was added to the Culinary Festival Frankfurt running at the same time as the Book Fair. And Hobbits – at the press conferences, on massive billboards, and in a costume contest judged by Richard Taylor – were unavoidable. Four years on, are our writers and publishers better off since New Zealand was Guest of Honour in 2012? The Publishers Association (PANZ) sent its official report to MCH in February 2013, but because some parts of that report are ‘commercially sensitive’, it’s not accessible to the public. Laville-Moore has provided what she describes as the key points. More than 13,500 news clippings about New Zealand as the GOH were generated throughout 2012, the vast majority carrying a books/content focus. 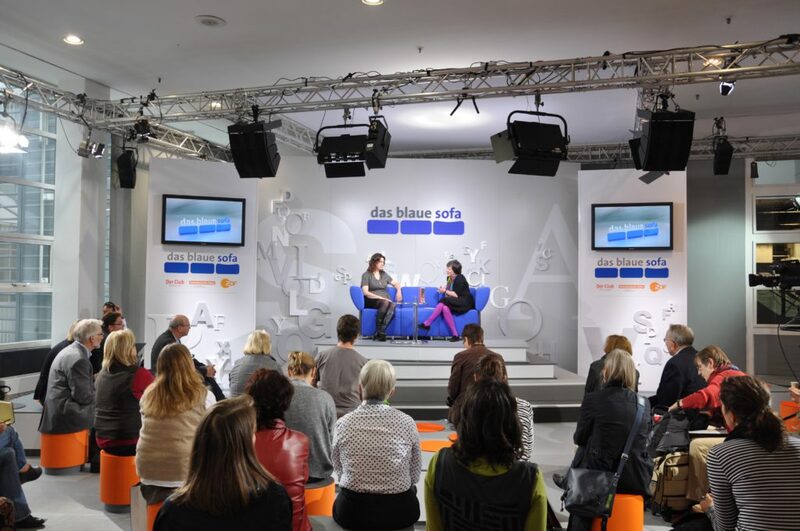 More than 300 New Zealand events were held in Germany leading up to and during the Book Fair, and an estimated 33,260 people saw live New Zealand author events in Germany throughout the year. Most vital: published translations in the German market were 800% higher than prior to Frankfurt 2012. New Zealand would normally sell the rights to about ten books into Germany each year, but in 2013 there were 35 confirmed rights sales and more than 150 active negotiations reported. Novelists Fiona Kidman and Paul Cleave were both back at the Frankfurt Book Fair in 2016: Cleave because he is a star in the lucrative German crime-writing market, with multiple best-selling titles, and Kidman because her novel The Infinite Air had just been published by Weidle Verlag under the title Jean Batten: Pilotin. German media named Kidman as one of the top ten writers at the Fair (after which a Protection Squad member was detailed to look after her). How did NZ’s GOH success compare with other countries? The Fair’s website freely mixes translations with acquisitions and new releases, so it’s hard to assess. 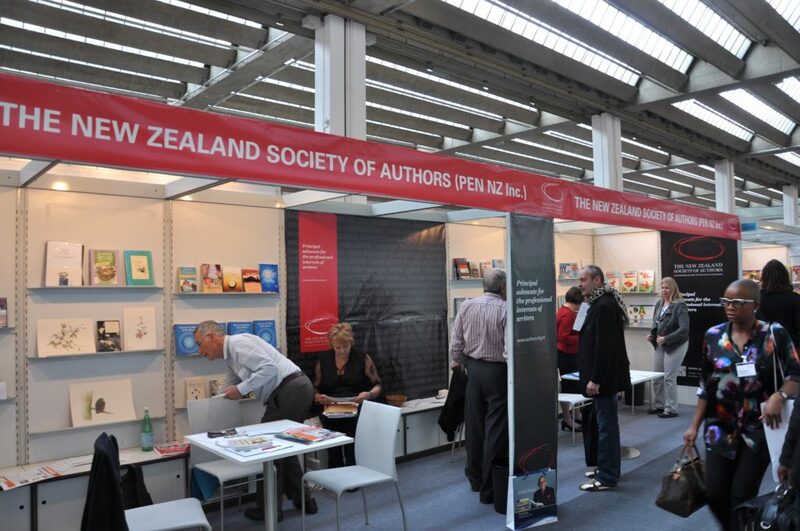 According to the Frankfurt Book Fair, New Zealand’s 2012 effort saw 104 German publishers include more than 200 new releases. But this isn’t quite the result achieved by Iceland in 2011 (111 German-language publishers with 230 new Iceland titles) or Brazil in 2013 (130 German publishers with more than 335 new releases, including 117 fiction titles). New Zealand had less time than most to plan and execute this than some other countries. In June this year it was announced that Canada will be GOH in 2020, more than four years away, but New Zealand’s feature role in 2012 was only agreed in early 2011 and confirmed in public by Minister Chris Finlayson that June. Chapman disputes any suggestion that New Zealand had a late invitation to Frankfurt and that this might have hampered our efforts, as discussions about a joint GOH with Australia in either 2015 or 2016 had begun as early as 2009. Still, the late official announcement gave publishers a smaller window in which to buy and sell rights – when perhaps, given the challenges of being a writer or publisher in New Zealand, our physical distance from and cultural differences with the European market, and how little known most of our books and writers are in Europe, a longer lead-time could have made a difference. For example, in 2014 and 2015 a special visitors programme saw 50 German publishers visit Flanders (Dutch-speaking Belgium) and the Netherlands, in preparation for the 2016 GOH programme, which showcased 454 new Dutch titles and 99 authors in Frankfurt. Some 30 translators contracted by German publishers stayed in translators’ houses in Amsterdam and Antwerp in 2015 and 2016. 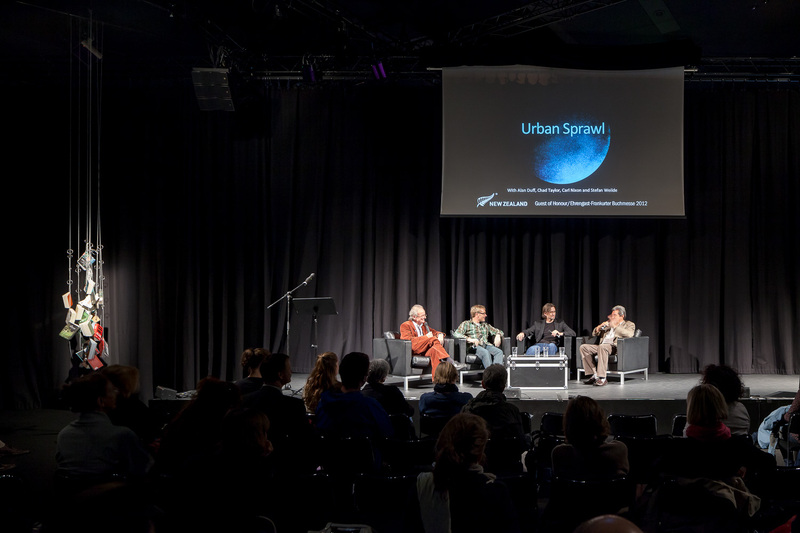 By contrast, a handful of German publishers and festival directors visited New Zealand in May 2012, funded by Creative New Zealand, just five months before the Book Fair itself. The Dutch publishers’ longer preparation time meant more complementary events could be planned – for example, this May and June the International Kinder- und Jugendbuchwochen (Children’s and Young Adult Book Weeks) in Köln were devoted entirely to Dutch-language literature. Physical proximity is also a clear advantage when it comes to placing writers in events. 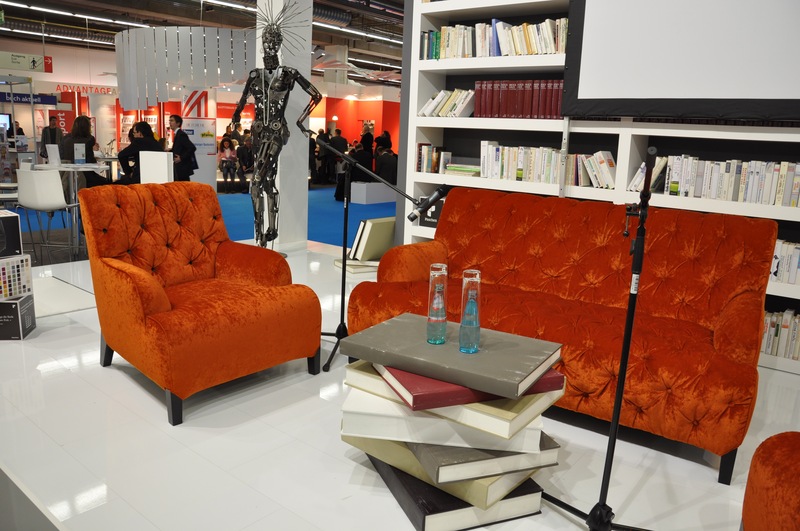 More than 170 Dutch and Flemish authors were on stage throughout Germany in the period leading up to the fair. In the lead-up to 2016, twelve German authors were awarded writers’ residences in the Netherlands and Flanders, and eleven Dutch-language authors had writers’ residences in Germany. This is a much more expensive proposition with New Zealand as a cultural partner, though a German writer-in residence programme was established in Wellington in 2014 as a mirror to the CNZ Berlin fellowship and to strengthen cultural exchange, and two new exchanges, with the Baltic states and Austria, are currently in talks with writers’ residencies in Auckland. A focus group that met in 2014 as part of CNZ’s 2015 Literature Review expressed concern that in the previous year literature had only attracted 8% of overall arts funding – ‘too low to sustain and develop a thriving literature sector’. Their concern will not have diminished: it’s been around 6% in the two most recent years. Music, dance and theatre, by comparison, get far more. Compare this with Australia – where, in the 2015/16 year, literature got 12.3% of the Australia Council for the Arts grants, more than theatre and dance, and approaching that of music. Chris Finlayson, arts minister at the time of NZ’s Frankfurt appearance, said that culture was ‘one of our best kept secrets’. For some in the literary community, it still is. Mark Broatch has been books and culture editor of the New Zealand Listener and the Sunday Star-Times. He is a former Sargeson fellow and the author of three books.